Talk about a great book for boys! Starting with a bit of talk about Batman’s vehicles this book poses the question “Are Batman’s high tech toys simply science fiction or could they exist in real life?” Superheros are hot right now (or are they always hot?!) Many boys dream of being Batman and driving the Batmobile. This book is a great way to explore Batman’s vehicles and what makes them so very cool. Tell your boys to put on their seat belts as this book will take them for a ride through the history, science and engineering behind Batman’s fun rides. There is a lot to love and a lot of ground covered in this highly entertaining book. Technical but easy to understand details explain where the technology that powers Batman’s vehicles currently exists and where it came from. There are good images to help give extra details on what they are talking about. See the first car to break the speed of sound (very cool! ), ejection seats, amphibious tugs, and explosion proof armored trucks, remote drive weapons and more. I was surprised at the amount of info packed into this book. Take a look at the image below to see the layout of the pages. Really nicely done and visually appealing. I think you will be impressed with how the information is presented. The format is easy on the eyes with some great Batman illustrations. It has real life photos of each topic they are discussing as well. The text is engaging and interesting. 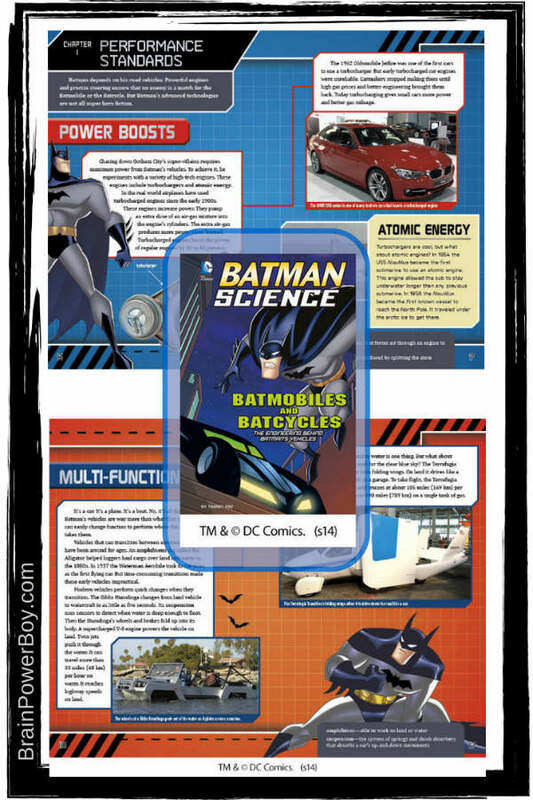 I like that Batmobiles and Batcycles has a nice glossary and a “read more” section with additional books about the science behind vehicles. 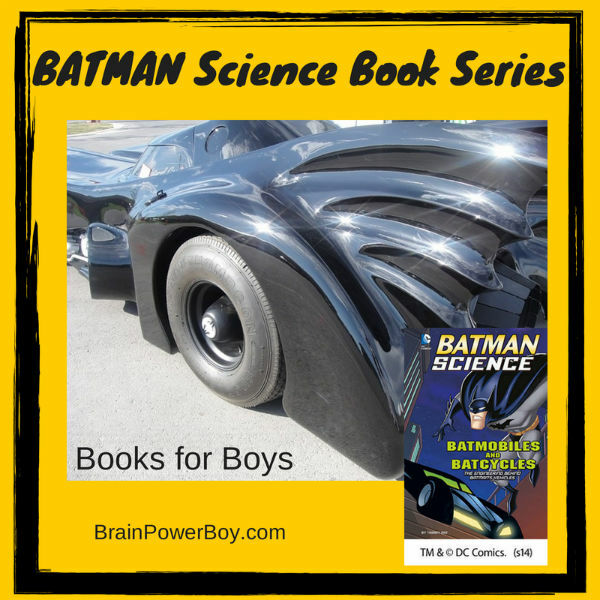 Batmobiles and Batcycles is just one book in The Batman Science series and they are all great. Capstone Press put out an entertaining book that makes learning about the science behind vehicles (especially the super ones like Batman uses) fun. Boys should love this one! Recommended. Here are some more great books for boys. and © DC Comics. (s14).